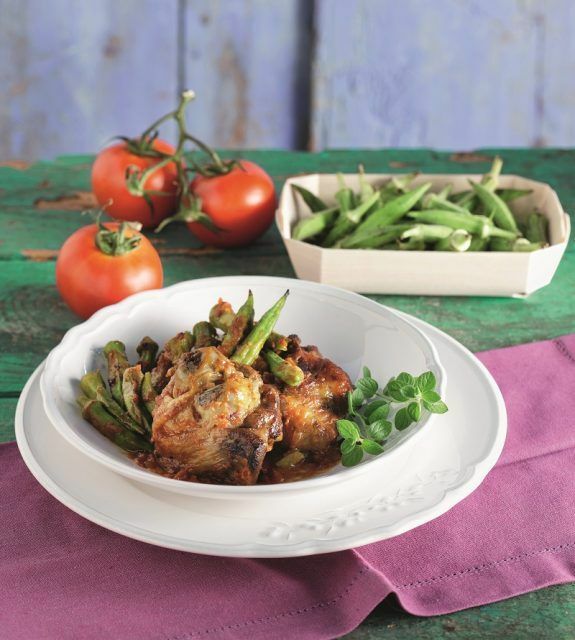 What a lovely combination, lamb with okras! Try it with any kind of meat you want. Remove the upper rims of the okras and a small part of their stems. Rinse, drain, season with a little salt, transfer in a bowl and marinate in the vinegar for 1 hour. Rinse, drain. Season lamb chunks well with salt and pepper. Dust with flour. In a large pot heat oil on high heat and cook lamb until nicely colored on all sides, for 5 minutes. Stir in onion and garlic and cook until fragrant. Add tomatoes and 1 cup of hot water and simmer for 40 minutes. Preheat oven at 160οC/fan. Transfer all pot ingredients in an ovenproof baking pan, okras and sprinkle with sugar. Cover with lid or foil and bake for 30 minutes until meat and okras are tender.